Offset’s first day, Friday 8 April, included speakers Stephen Kelleher, Reed + Rader, Rothco, Robert Ballagh, 4 Creative, Morag Myerscough and Mr Bingo, write Pam Bowman and Matt Edgar, and covered cats, failure, the pressure of success, the importance of teams and partnerships, belonging and performance. The Offset Festival has been running in Dublin since 2009, and it is now a huge event, a three-day conference for 2500 people at Dublin’s Bord Gais Theatre. The audience comprises students and professionals in the creative industries from Ireland, UK, Europe and the US. Looking at last year’s figures 65 per cent of the audience was professional and the remainder students. A majority of the audience (65 per cent) was aged between 22 and 35, so it felt more like a festival than a conference. 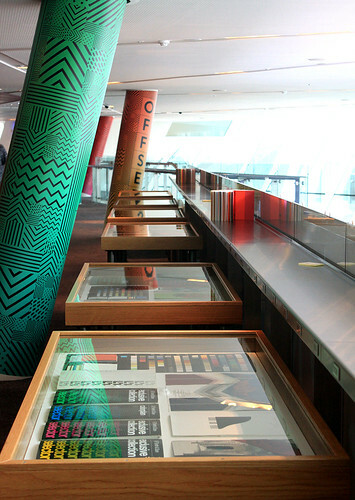 GF Smith exhibition on the first floor mezzanine at Offset 2016. Top: Mr Bingo on stage at Bord Gais Theatre. 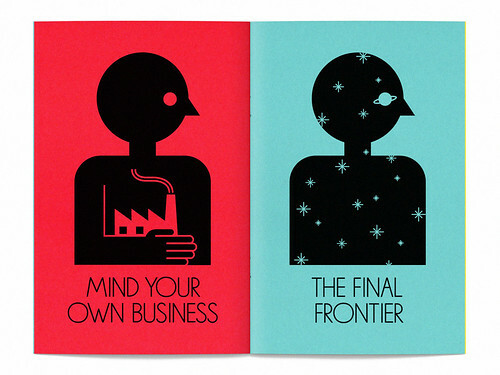 Spread from Stephen Kelleher’s Self-Help Book, a sixteen page zine. 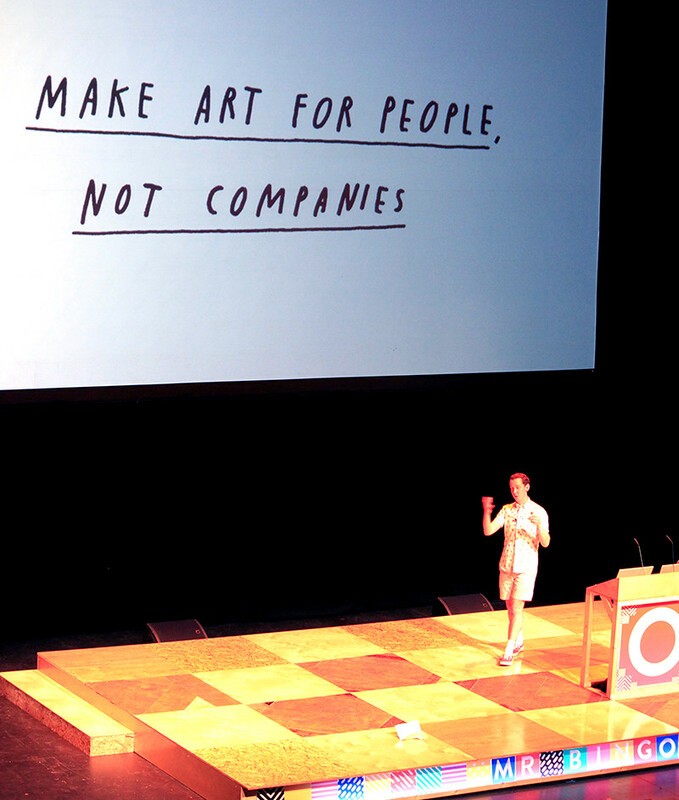 Brooklyn-based, Dublin-born graphic and motion designer Stephen Kelleher kicked off day one on the main stage and discussed the change in his work and approach to life, pre- and post-treatment for cancer. Selection of work by Reed + Rader. Pamela Reed and Matthew Rader, Reed + Rader. 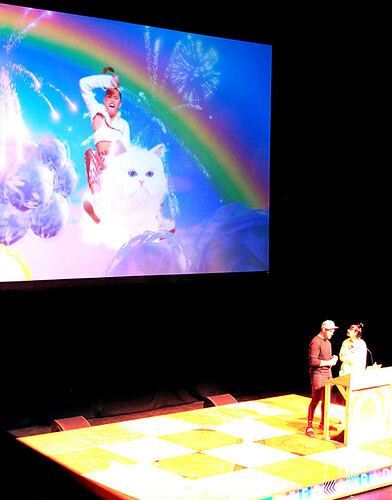 Following Kelleher were digital artists / art directors Pamela Reed and Matthew Rader, Reed & Rader, who introduced their five cats and spoke about their development from childhood to a fully grown married couple who create distinctive virtual worlds and playful animated gifs. They spoke about the challenges of being a couple and working together, attempting to separate life from work and define their roles. They began with still photography, introducing collage and eventually animated gifs. Dubstep Dinosaurs is an example of their work, using game development software called Unreal Engine to make film. Rothco, who discussed ‘How to work in advertising and not hate yourself’ and the importance of failure on the path to success – a theme that continued through the afternoon. Dublin painter Robert Ballagh began the afternoon by talking about the influence of music, contemporary art and ‘The Troubles’ on his work. Representing 4 Creative were art directors John and Chris who have worked together for twenty years. They came from an advertising background and now manage the creative direction of the Channel 4 brands. 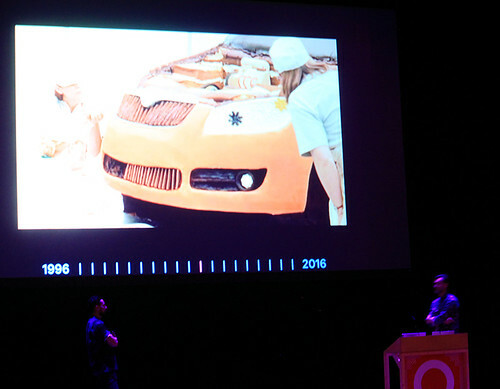 They had previously produced high-profile advertising campaigns, including the Skoda cake ad, they talked about success, failure and how to overcome the pressure designers put on themselves following success. 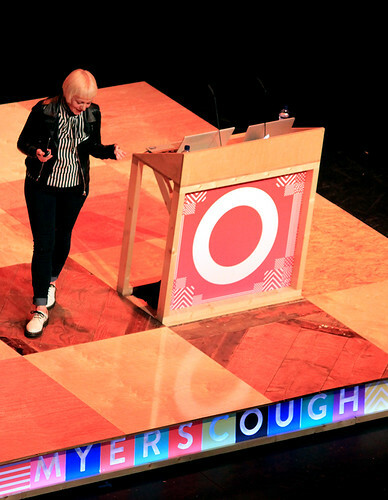 Morag Myerscough at Offset 2016. 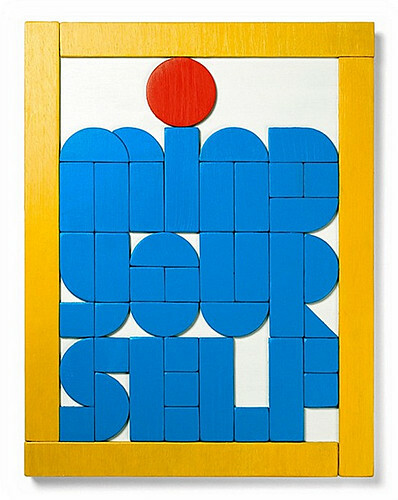 Morag Myerscough is always engaging, showing work she is passionate about and a process and language unique to her. (See ‘In the thick of it’ in Eye 79) The theme of ‘belonging’ was a thread that ran through the talk. Photographs of Myerscough’s parents, grandparents and great grandparents revealed a rich, sometimes exotic family history of theatricality and performance. Morag recalled that her father, Henry, would practice his viola as she and her sisters worked alongside her mother Betty in an adjoining room on her textile designs. Myerscough’s talk also about joyous collaboration that persists within her own practice. Her outsider’s eye is used to brilliant effect in the realisation of a recent project titled Mirar commissioned by the British Council and Abierto Mexicano de Diseño design festival. Inspired in part by Powell and Pressburger’s movie A Matter of Life and Death, Myerscough and partner Luke Morgan built a huge camera obscura in the centre of Zocalo Square. The resulting structure, clad in trademark neon pattern and supergraphic type, invites Mexico City residents to walk through the centre of the camera and see their city in another light, to rethink and re-imagine it in the process. Morag Myerscough and Luke Morgan’s Mirar at Abierto Mexicano de Diseño design festival, Mexico City. The final speaker of the day was Mr Bingo , who focused on his project ‘Hate Mail’, and the work involved in producing the rap video for his kickstarter campaign Hate Mail: The Definitive Project, which funded the production of a hardback book. The campaign was highly successful, exceeded the £35,000 target by £100k. 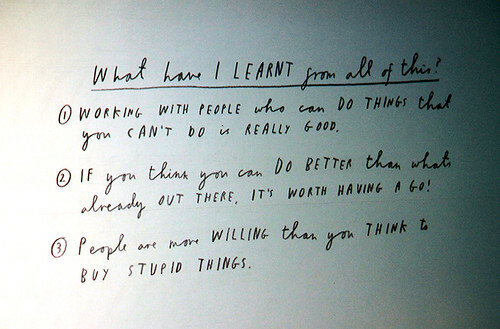 ‘People are more willing than you think to buy stupid things.’ A candid slide from Mr Bingo’s Offset 2016 talk. Financial breakdown for allocation of the Kickstarter funds. Mr Bingo’s promotional rap video, part of the Kickstarter campaign for the print publication of Hate Mail: The Definitive Collection. 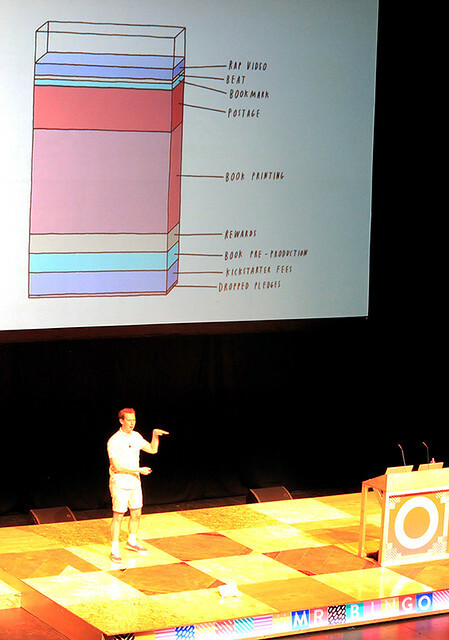 Day one of Offset made visible the diversity and transformative nature of design, with talks that were entertaining and informative in equal measure.